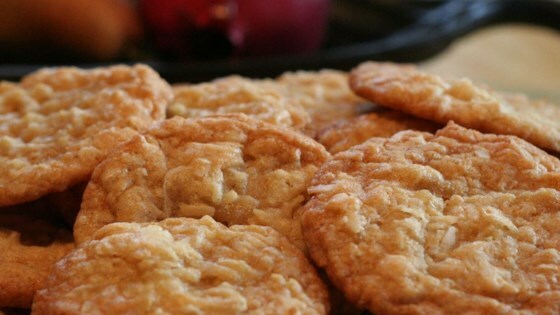 "Lots of coconut and sugar make these cookies chewy and delicious." Preheat oven to 350 degrees F (175 degrees C.) Combine the flour, baking soda, and salt; set aside. In a medium bowl, cream the butter, brown sugar, and white sugar until smooth. Beat in the egg and vanilla until light and fluffy. Gradually blend in the flour mixture, then mix in the coconut. Drop dough by teaspoonfuls onto an ungreased cookie sheet. Cookies should be about 3 inches apart.